Easy Piano. Composed by Various. Easy Piano Songbook. 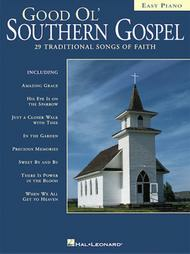 Gospel and Southern Gospel. Songbook. With vocal melody, piano accompaniment, lyrics and chord names. 64 pages. Published by Hal Leonard (HL.310502). Easy arrangements of 29 traditional songs of faith: Amazing Grace * Church in the Wildwood * His Eye Is on the Sparrow * Just a Closer Walk with Thee * In the Garden * Precious Memories * Rock of Ages * Shall We Gather at the River? * Sweet By and By * There Is Power in the Blood * When We All Get to Heaven * more. My 91 yr old Mother still plays piano and wanted the music for "His Eye is on the Sparrow". Someone else's review on this book said the easy arrangements were great, and that helped me select this book for Mom's gift. And it is perfect! 21 of 51 people found this review helpful. Today was the first time that I used the music. I found it very easy to use, and extremely easy to understand. its been years since I have played by music, however using this book brought back my basic music reading abilities instantaneously! perfect for her skill level! Thank you!! It is a wonderful book. I'm so glad that I ordered it. I certainly recommend it. 26 of 57 people found this review helpful. I think I could of probably made a better choice such as easier piano. this one was a little-bit to advanced, but I'm managing to teach it pretty good. 29 of 60 people found this review helpful.